We are in the full swing of Christmas people!! We are as festive and extra as we could possibly be (which, you know is a lot) and pretty much live for any and everything Christmas! So, you know we had to put together the best dang Christmas bucketlist of things we don’t want to miss this Christmas season! And we are bringing it to you for free! Download it. Print it. Get in the holiday spirit. Do all the Christmas things! You won’t regret it. I mean, the best way to spread Christmas cheer is singing loud for all to hear, right?! And, doing all the things on our Christmas bucketlist. That will spread just as much Christmas cheer. Check it out! I mean—tell me you’re not in the holiday spirit now?! It’s scientifically impossible! 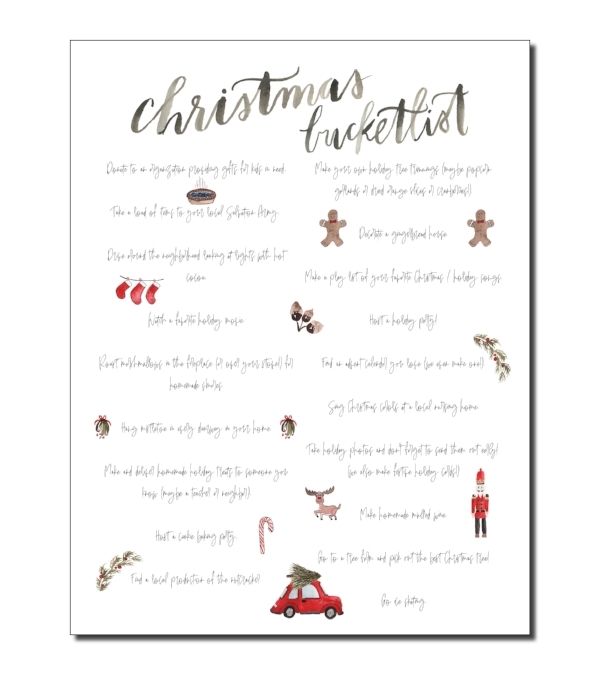 FREE DOWNLOAD: To download this festive Christmas bucketlist, simply head to this page on our website and you’ll be able to download it for free! What are you most looking forward to this Christmas season? Do you have a particular favorite tradition that you are just so excited for? Share your best holiday traditions and Christmas activities below! We’d love to hear how you celebrate the season! Cheers to holiday magic in all its glory!